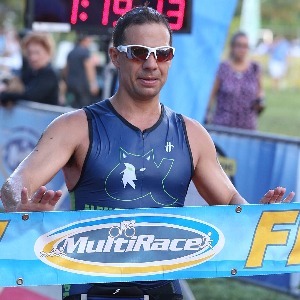 My name is Joey Perez and I've been an active triathlete over the past 9 years. However, I started my endurance athletic journey at 14 years old as a swimmer. After graduating college, I did what most of us do... Gain a lot of weight and focus solely on work. I decided to turn my life around and started by running. I eventually picked up swimming again and added biking. Now my goal is to help others balance the demand of work, life and triathlon in order to achieve their goals!! I believe that training for a triathlon all begins with finding the right balance between work, life and tri. The focus should be on quality as opposed to quantity. In addition, a training plan is similar to a flight plan. You know the city you are starting from and you know your final destination, but the route from point A to point B may change based on your life. I am a USAT Certified Level 1 coach that has been fortunate enough to train over 25 athletes at every distance from Sprint to Ironman over the last 4 years. I've had athletes qualify for the USAT Age Group National Championships, ITU World Championships, 70.3 World Championships and Kona World Championships. Finding the right coach that fits your lifestyle and goals is the most important step for a triathlete. After this critical step is accomplished, the rest is just execution. I hope to be able to be that coach for you! I have two requirements: 1) That my athletes know how to swim, bike and run and 2) That my athletes are committed. Success. Coach Joey Perez has been notified of your message.